Winfield Patio Homes is an area in Winfield, in the North Scottsdale Boulders Character area. These homes range in size from 2024 to 2442 square feet. These 2 and 3 bedroom homes have 10 foot ceilings and covered patios. Winfield Villas Homes is an area in Winfield, in the North Scottsdale Boulders Character area. These homes are town homes: share a common wall(s) with their neightbor. HOA fee includes exterior maintenance, front yard maintenance and roof reair/replacement. The Villas provide a lock and leave lifestyle. Montesano at Winfield is a custom home subdivision in the gated area of Winfield, in the North Scottsdale Boulders Character area. A variety of custom home builders are created some spectacular homes. 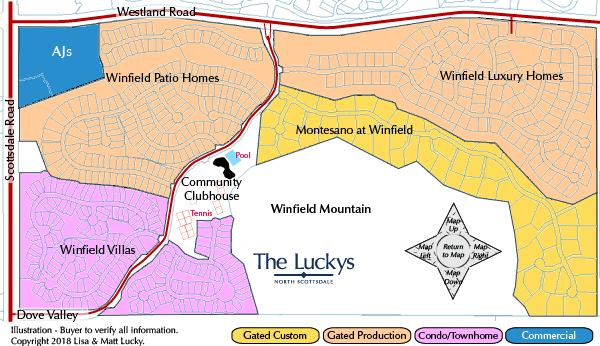 Winfield Luxury Homes is an area in Winfield, in the North Scottsdale Boulders Character area. Homes were built by Pulte Homes with standard floor plans ranging from 2,300 to approximately 3,000 square feet. These are 2 and 3 bedroom floor plans with some plans having an optional Casita. The Boulders is a master planned community of luxury homes on approximately 1,000 acres. The Boulders Resort and Golden Door Spa has been named America's Top Resorts. The resort complex features two outstanding 18 hole courses, which are continually alternated, allowing for one to be kept private for members while the other is used by the hotel guests. The facility consistently appears on everyone's "Top 100" list, due in part to the excellent course maintenance and incredible scenery. Whisper Rock Estates is a exclusive guard-gated golf community on 850-acres in North Scottsdale which offers large custom home sites, ranging from one to five acres. Homesite have lush desert vegetation and superb 360-degree distant views of the McDowell's, Pinnacle Peak, Black Mountain, and Tonto National Forest. Smaller Boulder Character Area subdivisions include Baraca Estates, Boldero, Bella Tierra (aka Boulder Ridge), Cortona, Desert Springs, Encanto Norte, Cantada (aka Hawknest Trail), Copper Sky(future), Hawknest (future), Ironwood Retreat, Joy Ranch, Sand Flower, Sierra Boulders, Sierra Highlands, Sunflower Estates, Tecolote, Verdante at Westland Estates, Vista Viento, Vistas At Desert Shadows, Westland Estates, and Windmill by Bob Bacon. Winfield is a 300-acres guard gated Del Webb community on Scottsdale Road, south of Carefree Highway, and nestled between Whisper Rock and The Boulders. Named for the founder of Scottsdale, Winfield Scott, the guard-gated community offers the best of both Scottsdale and Carefree. The 75-acre Winfield Mountain Preserve ensures residents will enjoy the natural beauty of arroyos, desert trees, majestic saguaro cacti and other desert vegetation or the High Sonoran Desert. Most homes enjoy views of nearby Black Mountain and city lights. The Clubhouse at Winfield is approximately 13,500 square feet, with facilities and many activities for their residents to enjoy, including: 8 lighted tennis courts (2 clay), heated Olympic-sized pool and spa, men’s and women’s locker room, sauna, fitness center, aerobics, and 8 miles of hiking trails. Also enjoy the Standing Rock Café, a homeowner run cafe in the community clubhouse. See all Winfield - New. See all Winfield - Sold.